The 130mph Isle of Man TT lap gets tantalisingly closer. John McGuinness clocked a stunning 129mph lap tonight (Thursday) on the HM Plant Honda in practice for Saturday’s superbike race. McGuinness had run fourth for most of the first lap but was the quickest on the road from Cronk y Mona through to the Grandstand as he started his flying lap. He lapped at 17m 32.24s, 129.084mph, 7.5s quicker than Guy Martin on the Hydrex Honda and just outside his own lap record of 129.54mph set last year. Guy Martin clocked 128.166 on the Hydrex Honda and Ian Lougher did 128.14mph on the Stobart Honda. HM Plant Honda’s Ian Hutchison was fourth quickest with a lap of 127.54mph ahead of Martin Finnegan’s Klaffi Honda (127.29mph). Michael Rutter was slowed by a slipping clutch on his first lap with the MSS Kawasaki. He went out on his supersport bike for two laps while the crew rebuilt the clutch. He did 125.00mph on the superbike – the first time he managed two laps in one session on the ZX-10. Bruce Anstey was plagued with handling problems on the Relentless Suzuki superbike but topped the Supersport leaderboard with a lap of 122.61mph. 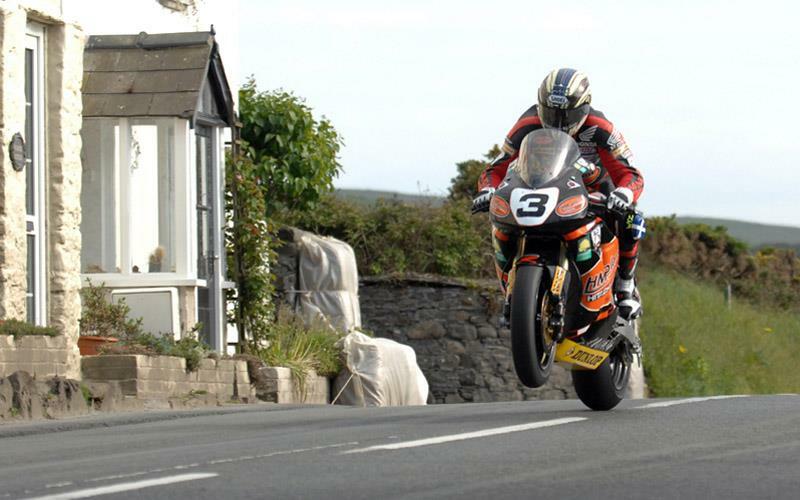 Guy Martin was second quickest from Ryan Farquhar and Ian Lougher. McGuinness and Hutchinson both went out late in the session on their 600s and completed a short lap so their laps of 120.24mph and 119.9mph respectively were not really indicative of their true speed. Anstey was also fastest in Superstock with a 125.10mph lap on the GSX-R1000. McGuinness was second quickest from Finnegan on the MV Agusta.